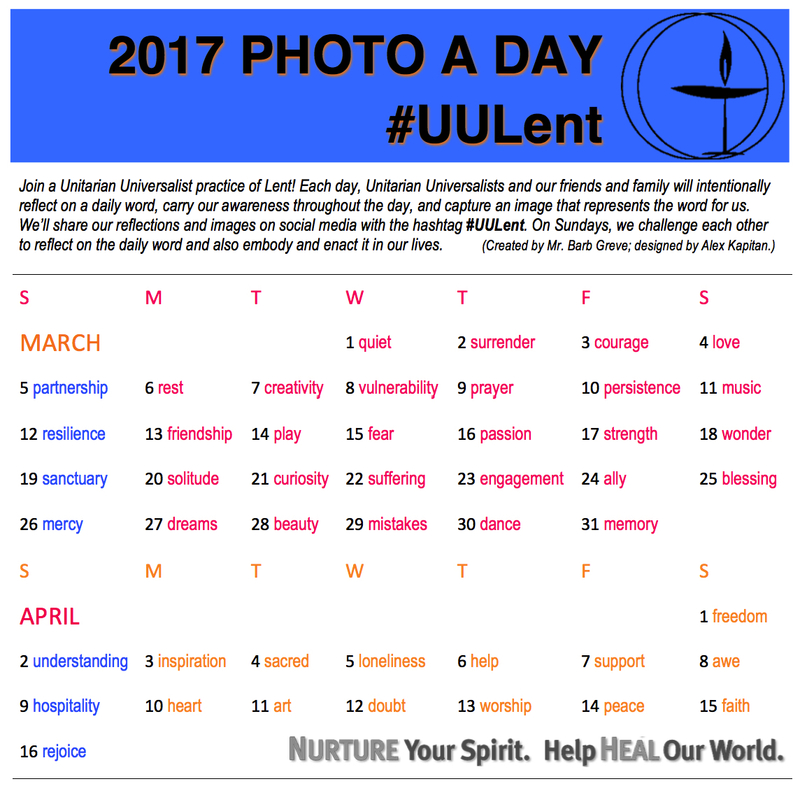 #UULent has been created as a way for Unitarian Universalists to engage in a shared spiritual practice alongside siblings in faith who are observing Lent. In some Christian traditions, in preparation for the celebration of Easter, the faithful make a personal sacrifice as a way of bringing them closer to G*d, and reminding them of the sacrifices that Jesus and his followers made. As Unitarian Universalists, we share theological roots with our Christian siblings. However, rather than a practice of self-denial, this is an opportunity to spend the Season of Lent engaged in a spiritual discipline of deep intention and appreciation of our world, our place in it, and an openness to Grace in our daily lives. #UULent is designed to be used individually, as a family, or as a congregation. For each day in Lent a word has been selected. Each day participants are invited to reflect on the meaning of the day’s word, then create a photograph that represents the word, idea, practice, or concept and post it here and/or elsewhere. Beginning on Ash Wednesday and for each day until Easter, the word for the day and a related quote will be posted on the #UULent FaceBook page. Reflect and engage throughout the day, checking for the word and quote in the morning, then return later in the day to add your photo* and to see the images and words others have shared throughout the day (*YOUR photo – please respect copyright!). Or if you prefer, use another social media platform to share your photos. Versions of the graphic: pdf and jpg. May this intentional practice and discipline impact your daily life in ways that bring you closer to your spiritual core and offer you resiliency for life. yet for some of us it has always been a scary world. For some of us, the very act of living is a radical act of resistance. May we each find the strength to continue living. For some of us, our bodies have been battlegrounds for far too long. May we continue to be resilient in the face of hatred, bigotry, and violence. remembering that all life is sacred. and offer each other deep, life-affirming Love. but it has always been just over the next hill. but a way of life. Two years ago Karen Bellevance-Grace and I created a Tumblr as a way for Unitarian Universalists to engage in a shared spiritual practice around the same time that some of our siblings in faith are observing Lent. In some Christian traditions, in preparation for the celebration of Easter, the faithful make a personal sacrifice as a way of bringing them closer to God, and reminding them of the sacrifices that Jesus and his followers made. As Unitarian Universalists, we share theological roots with our Christian siblings, who observe Lent from Ash Wednesday until Easter. However, rather than a practice of self-denial, we offer this opportunity to spend the Season of Lent engaged in a spiritual discipline of deep intention and appreciation of our world, our place in it, and an openness to Grace in our daily lives. #UULent is designed to be used individually, as a family, or as a congregation. 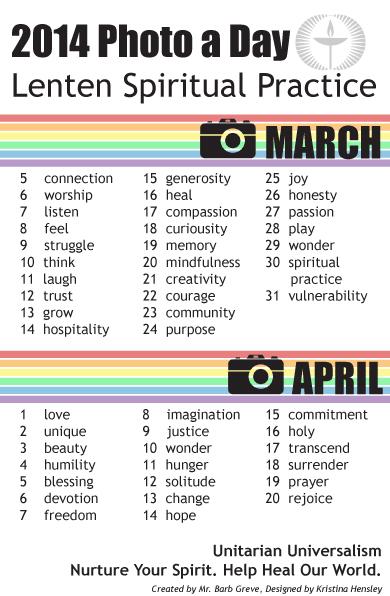 We selected a word for each day in Lent (see attached graphic for this year’s words). We believe each word will be accessible to all ages and stages of faith development. Reflect on the meaning of this word to you. Take a photograph each day that speaks to you about the word, idea, practice, or concept. Share it on social media with the hashtag #UULent, and celebrate the shared inspiration we bring to one another. Please respect copyright and use only pictures you yourself have taken. On Sundays throughout Lent, we challenge ourselves to not only reflect on the given word, but to enact it in our world. On Service Sundays we will share not only images and brief reflections, but we will embody the spirit of the words, and share in this virtual community how the daily word moved us to make our faith manifest in our physical community. Thank you for being part of of our shared spiritual practice, know that your words and images are a deep blessing to us. With gratitude to Karen Bellavance-grace, who co-founded this with me and Alex Kapitan, who joined me in 2016. You are invited to join the UU Lenten Spiritual practice. A word has been selected for each day in Lent. Reflect on the meaning and gifts of that word. Find a photograph each day that speaks to you about that word, idea, practice, or concept. Share it on PracticingLent.Tumblr.com and/or on Facebook, and celebrate the shared inspiration we bring to one another. This practice began on March 5, and will run every day between now and Easter. Each day, we will add the day’s word and a related quote to the main Practicing Lent page. Check the word and quote in the morning, and come back later in the day to add your photo (YOUR photo – please respect copyright!) and to see images our fellow Unitarian Universalists have responded with throughout the day. A new word and quote will appear each day throughout the Lenten season. We invite you to share with us along the way how this intentional practice and discipline impacts your daily life. Sometimes life is too beautiful! I went to leave my folks’ house today and my mom pointed out the walkway. We paused for a moment to enjoy the wonderous beauty and for a moment were grateful to not be rushing past. If you do the task before you always adhering to strict reason with zeal and energy and yet with humanity, disregarding all lesser ends and keeping the divinity within you pure and upright, as though you were even now faced with its recall – if you hold steadily to this, staying for nothing and shrinking from nothing, only seeking in each passing action a conformity with nature and in each word and utterance a fearless truthfulness, then shall the good life be yours. And from this course no man has the power to hold you back.